Individual cow factors, such as age and stage of lactation, influence the true cost of lameness. lameness in early lactation is the most costly, due in part to reduced reproductive performance and lost milk sales. 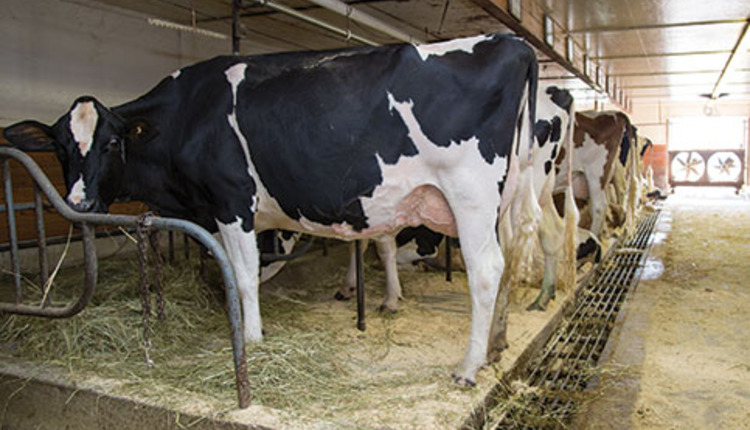 Lameness is one of the most expensive diseases a dairy cow can get. 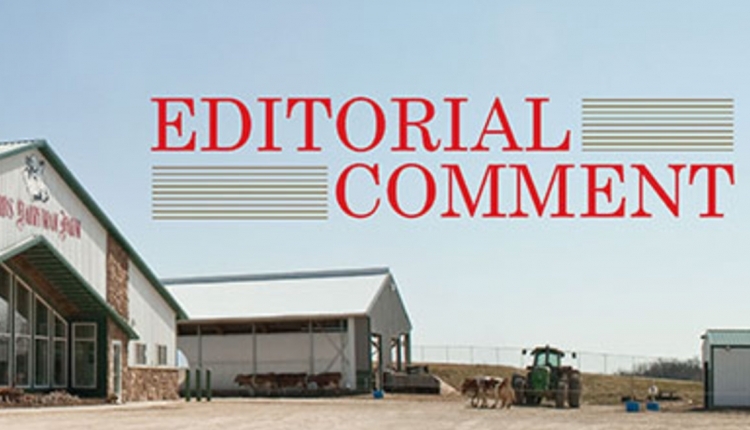 But, have you ever thought about the cost of lameness being different for different cows? Not only does the type of disease-causing lameness change the cost, but so does the age of the cow and the point in lactation that lameness occurs. 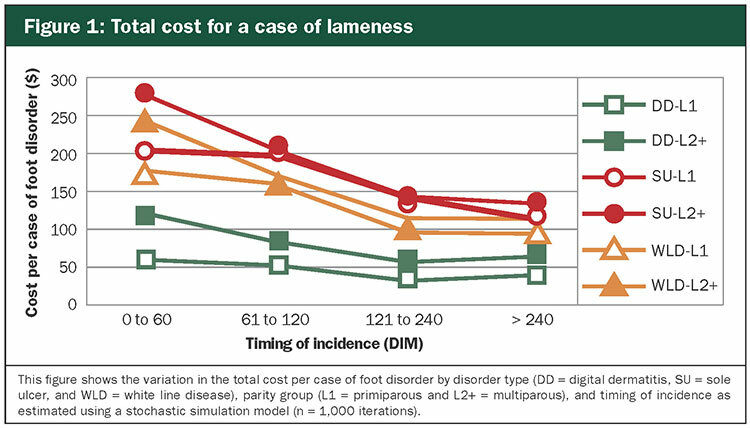 To explore these relationships, we built a simulation model to evaluate the cost of lameness by disease type, parity, and timing of incidence (days in milk or DIM)in a typical U.S. dairy herd. The model included the three most common foot disorders in the U.S.: digital dermatitis, sole ulcers, and white line disease. We also evaluated if the case occurred in a first lactation or older cow and if the case happened in early lactation (0 to 60 DIM), peak lactation (61 to 120 DIM), post-peak lactation (121 to 240 DIM), or late lactation (greater than 240 DIM). 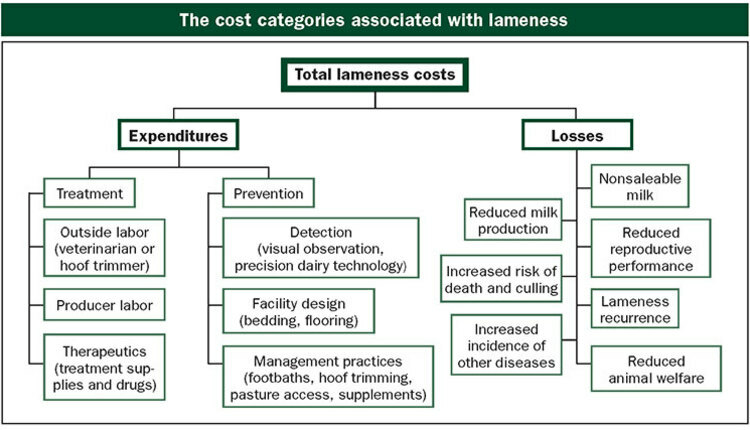 From literature, we collected the estimated cost of each case of lameness. This was calculated as the combined cost of therapeutics, outside labor (such as a hoof trimmer or veterinarian), on-farm labor, discarded milk, reduced milk production, extended days open, an elevated risk of culling, a higher risk of death (natural or euthanized), and disease recurrence. So, what factors impacted the cost? 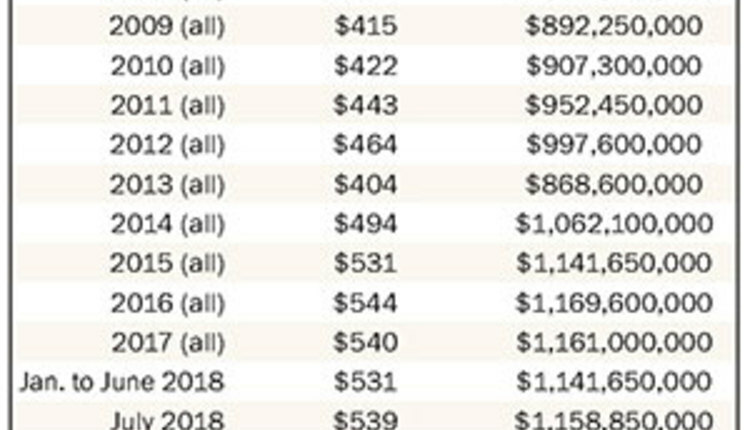 Using our model, we estimated that the average mean plus or minus standard deviation cost per case of digital dermatitis was $64 plus or minus $24. For sole ulcers, it was $178 plus or minus $29 and for white line disease, it was $152 plus or minus $26. A cow’s parity influenced the cost of disease most for digital dermatitis. Age was also a factor in early lactation cases of sole ulcers and white line disease (Figure 1). Older cows have greater milk production levels and, therefore, greater milk loss when disease occurs. This contributed to the greater cost for older animals. 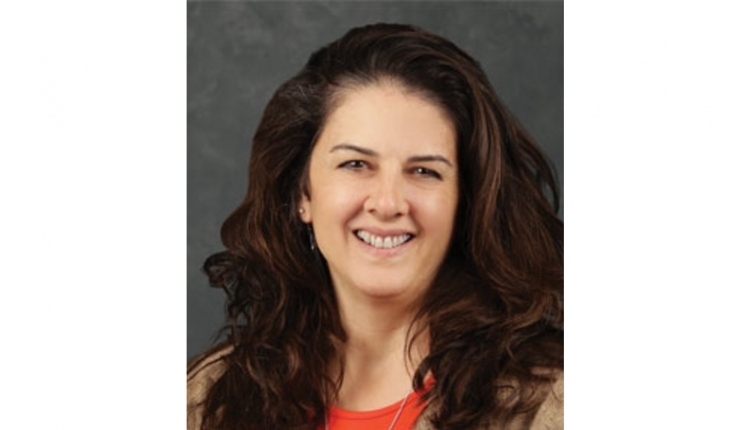 For all three foot disorders, the cost per case was highest in early lactation. 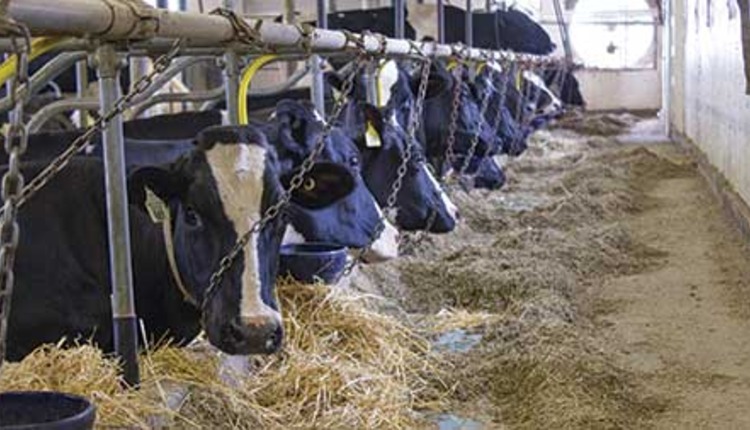 Lameness was assumed to reduce milk production for the remainder of lactation following occurrence, which contributed greatly to the higher cost in early lactation. Additionally, lameness could have large negative consequences on a nonpregnant cow in early lactation. Meanwhile, a case of lameness occurring after pregnancy establishment (in later lactation) has minimal known effects on reproduction. 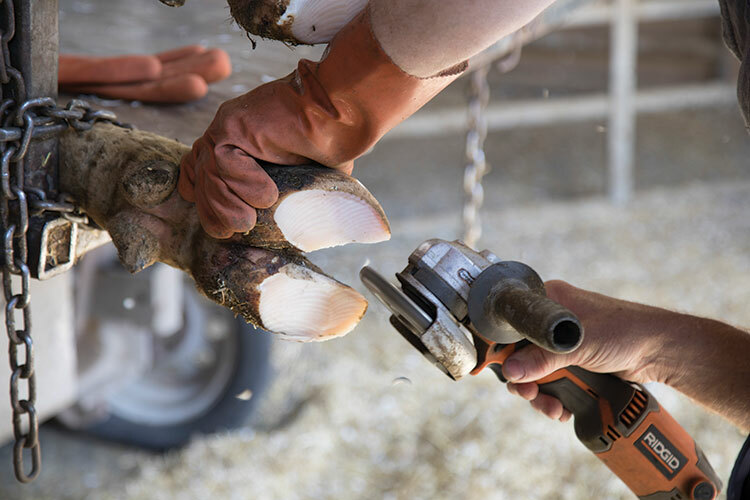 Knowing how the cost of lameness varies based on disease type, cow age, and timing can help guide on-farm decisions regarding when and if to treat a particular animal. 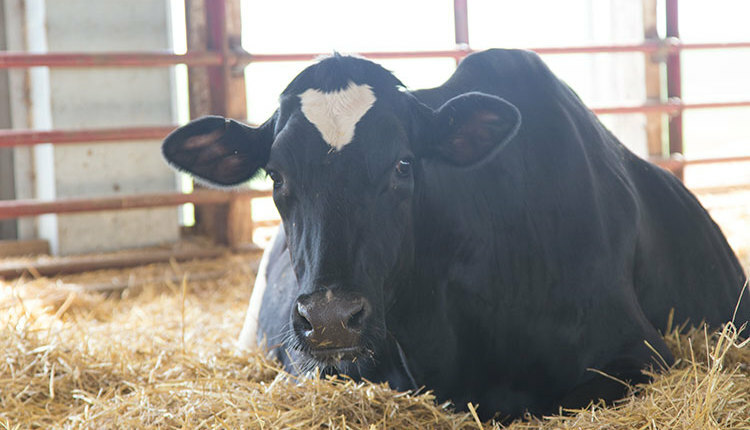 For example, let’s say an older cow is diagnosed with a sole ulcer two weeks into her lactation at the same time that a first-lactation animal in late lactation is diagnosed with digital dermatitis. A farmer should seriously consider culling the older animal and treating the younger animal as opposed to culling the younger cow and treating the older one. Additionally, knowing these differences in costs can help farmers focus lameness prevention efforts. If resources are limited and lameness prevention is not possible for all cows, our model indicates that efforts to reduce lameness — such as footbaths and trimming — should focus on early-lactation animals or potentially dry animals. This would help reduce lameness in early lactation when costs are the highest.